EDMONTON, AB – Don’t call them a dynasty. On Sunday evening, the no. 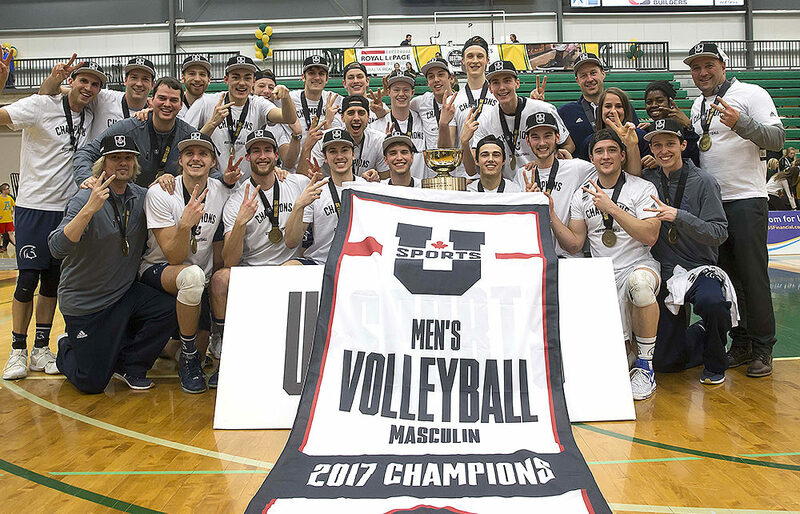 1-ranked Trinity Western Spartans claimed their second consecutive U Sports Men’s Volleyball National Championship, upending the host no.7-ranked Alberta Golden Bears in a high-flying 3-1 (25-20, 25-20, 27-29, 25-23) win in the 2017 edition of the best-on-best tournament. However, even though their win at nationals a year ago, taking down the McMaster Marauders for the 2016 crown, puts them in position for the first three-peat since the Winnipeg Wesmen dynasty of the early 1970s, Spartans head coach Ben Josephson still has the bigger picture in mind when it comes to labelling his burgeoning superteam. The Spartans had several players cement their legacies on the court – junior middle Aaron Boettcher took home Player of the Game honours after a monstrous six-kill, 14-block (yup, 14) performance. Blake Scheerboorn led the offense with a game-high 22 kills and two blocks. Setter Adam Schrimer earned tourney MVP honours after a 48-assist, four-kill showing in the finale, while both Eric Loeppky and Ryan Sclater had 12 kills apiece. The Spartans came out red-hot in the opening two frames, posting a combined 30 kills with just eight errors on 55 swings (0.392). The Golden Bears couldn’t do anything to slow down the Spartans’ formidable weapons on the outside, while Boettcher was doing an impression of a one-man wall to stymie their play at the net. Once down 22-19 in the third, the Golden Bears clawed back on the strength of their seniors, Roy Nickifor, Taylor Arnett, and Alex McMullin drew the Spartans even at 22-apiece before eventually claiming the frame for the hosts. The Bears took as much as a six-point lead midway through the fourth frame, leading 13-7. A few plays later, back-to-back Scheerborn kills and a McMullin error knotted it up at 17-17. Then, at 21-21, Boettcher notched a kill then goes up for the next two blocks, bringing the contest to match point. After the Bears got a couple back, Boettcher put the season to bed with a block on Arnett. Including their toppling of Manitoba in Winnipeg for last week’s Canada West Championship, and besting McMaster on their home court last year, the Spartans have claimed their last three major trophies on the home court of their opponent. There’s a reason that his club is so good under the gaze of hostile crowds, according to Josephson. A talented team with a long legacy yet left to write. The season ended on a sour note for the UBC Thunderbirds men’s volleyball team on Sunday afternoon, as they were swept by the McMaster Marauders 3-0 in the Bronze Medal match of the 2017 U Sports National Championships. Though not excusing the performance, which saw the ‘Birds concede an average of 13 kills and 1.25 aces per set, UBC head coach Kerry MacDonald pointed to the emotional letdown of dropping a five-set match to the Alberta Pandas in yesterday’s semifinal. The ‘Birds had a chance to make a game of it in the second stanza, leading 22-19 and forcing the Marauders into a timeout. But McMaster stormed out of the break with a 4-1 run to equalize at 23-23. The tight set ended 27-25 for the Marauders following a pair of kill attempts went long off the hands of UBC middle Joel Regehr. Despite a game-high 13 kills from Irvan Brar, the ‘Birds just couldn’t generate enough offense to penetrate the renowned wall of McMaster’s defense – the Marauders finished the contest with 13 total blocks. Despite the disappointing finish to the team’s first trip to the national tournament in nine years, the stark turnaround the Thunderbirds made this season under first-year head coach McDonald is a boon going forward. Going from a team that missed qualifying for the Canada West playoffs last season is quite the turnaround. Though MacDonald refuses to take the lion’s share of the credit. And now that they have, MacDonald is looking to make the trip to nationals a little more frequent, and a little more ambitious.